Kirishima-photo1: Oblique view of Kishirima Volcano from the southwest (taken by Y. Miyabuchi). Kirishima Volcano is a Quaternary composite volcano located in southern Kyushu, southwestern Japan. It spans about 30 km from east to west and 25 km from north to south, and includes a cluster of more than 25 small andesitic stratovolcanoes and two calderas (Kobayashi and Kakuto calderas). The volcano has been active for the last 600 ka, and the composite is divided into two groups: Older Kirishima and Younger Kirishima Volcanoes. The Older Kirishima Volcano (600-330 ka) is characterized by caldera-forming eruptions involving two large pyroclastic flows (Kobayashi-Kasamori and Kakuto pyroclastic flows). In contrast, the Younger Kirishima Volcano began its activity at 330 ka. The activity of plinian, vulcanian, strombolian and phreatomagmatic eruptions, which produced numerous fallout tephra layers, gave rise to more than 25 small stratovolcanoes and pyroclastic cones, including Onamiike (45 ka), Ohatayama (45-38 ka), Karakunidake (the highest peak of Kirishima Volcano; 22-15 ka), Shinmoedake (10.4 ka-present), Takachihonomine (8.1-6.8 ka), Miike maar (4.6 ka) and Ohachi (8-18C). The craters of at least six volcanoes are occupied by volcanic lakes. 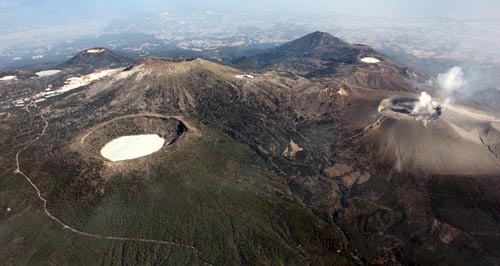 Shinmoedake, which is located near the center of Kirishima Volcano, is a andesitic stratovolcano. Its crater is approximately 800 m in diameter and 180 m in depth from the summit. It began its activity at 10.4 ka, and has continued to undergo intermittent small eruptive episodes. The 1716-1717 Kyoho eruption has been the largest eruptive event at Shinmoedake Volcano, and produced pumice-fall deposits dispersed over large areas east of the summit crater, and pyroclastic flows cascaded down slopes all round the volcano. The latest eruption of Shinmoedake occurred between January and August 2011. The series of the eruption was characterized by subplinian eruptions, lava effusion in the summit crater, and vulcanian explosions. Although a crater lake existed at Shinmoedake, the lake disappeared due to the 2011 eruption. Aso Volcano, which is located in central Kyushu, southwestern Japan, is one of the largest caldera volcanoes in the world. The Aso caldera, which is 25 km in north-south and 18 km in east-west, was formed by four gigantic pyroclastic-flow eruptions of andesitic to rhyolitic magma, from ca. 270 ka to 90 ka. The caldera-forming pyroclastic-flow deposits are divided into four units: Aso-1 (270 ka), Aso-2 (140 ka), Aso-3 (120 ka) and Aso-4 (90 ka) in ascending order. The Aso-4 eruption is the largest eruption of Aso Volcano, and produced multiple pyroclastic flow units. The Aso-4 pyroclastic flows with a volume of more than 200 km3 cover most part of the central Kyushu. These flows, which ran across the sea, reached an area of about 150 km from the source. Post-caldera cones initiated their eruptive activity soon after the last caldera-forming eruption (90 ka). The central cones have produced voluminous fallout tephra layers and lava flows. At least seventeen cones are visible on the surface, but the shapes and structures of the central cones vary depending on their chemistry, which ranges from basalt to rhyolite. Nakadake Volcano is the only active central cone in Aso caldera, one of the most active volcanoes in Japan, and a composite volcano of basaltic andesite to basalt, which has been active since ca. 22-21 ka. It consists of old and young edifice, and new pyroclastic cone on the former. The active crater of Nakadake is occupied by a hyperacid lake in dormant periods. In relatively active periods, the most characteristic activity is a continuous emission of black sandy ash (ash eruption). In more active periods, strombolian eruptions occurred, scattering red-hot scoria clasts around the vent. Occasional phreatomagmatic explosions ejected coarse lithic blocks accompanied by small pyroclastic flows.